The SGR-ReSI is a remote sensing instrument based upon Surrey’s GNSS (Global Navigation Satellite System) technology, targeting ocean, land, cryospheric, and atmospheric applications. Measurement of GPS signals reflected off the ocean surface can be used to determine ocean roughness, and hence sea state. In a similar way, ice crossings can be detected and mapped, and measurements off land can be used to assess soil moisture and assist in flooding extent knowledge. Atmospheric monitoring can also be performed using reflectometry or radio-occultation techniques. 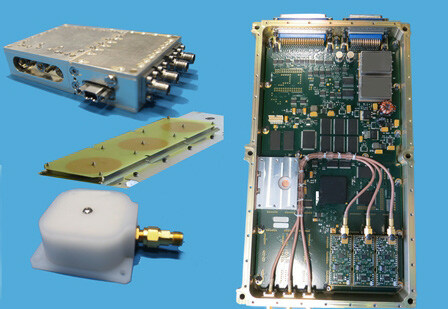 Surrey is a world leader in space-borne GPS detection and measurement, and its SGR-10 and SGR-20 receivers have been used on many satellites for positioning, timing, and orbit determination. The SGR-ReSI is now flying on Surrey’s TechDemoSat-1 mission, and has also been selected to fly on the University of Michigan’s eight-nanosatellite CYGNSS (Cyclone Global Navigation Satellite System) constellation, aiming to detect hurricane formation.